First lopapeysa I was happy with. Whenever it comes to knitting something for myself is always complicated. Things are usually either too big or too small or I see all the little mistakes I could have possible made while knitting and so on. Most of the times that I knit something for myself I end up giving it away! * A lopapeysa which was the first one that I could finally say "yay! It fits perfectly on me!" Haka, THE hat I have. * A short scarf with buttons. This was a HUGE achievement. I was still very new into knitting when this scarf came across. It looked very simple but NO! It wasn't at all. It is Brioche stitch. It has been my only experience with it and it was so hard! I remember that I couln't make any mistakes because it was so hard to "read" the stitches. I started it several times and everytime I made a mistake I had to frog it all and start all over until I managed to make it all without making any mistakes! I have used it A LOT. * A pair of mittens. I would really like to have a closet full of things for me made by me... but it doesn't seem to work. 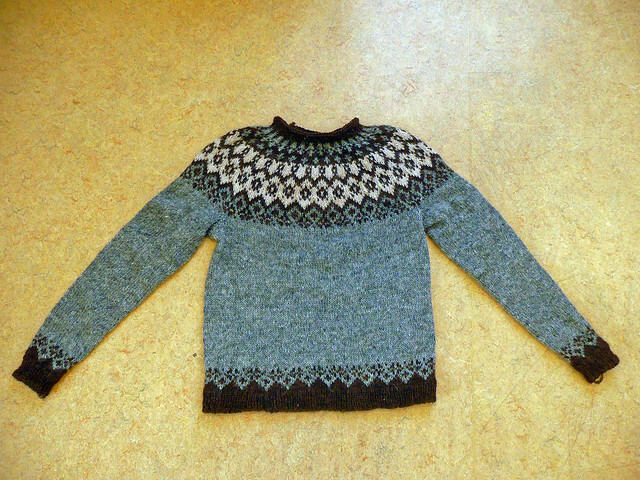 The last thing I tried to knit for myself was a lopapeysa. I wanted it to be very light and easy to wear under any kind of jacket. Lopapeysas are usually a bit chunky and not very comfortable to wear under a jacket, parka or wind jacket (unless it is huge). 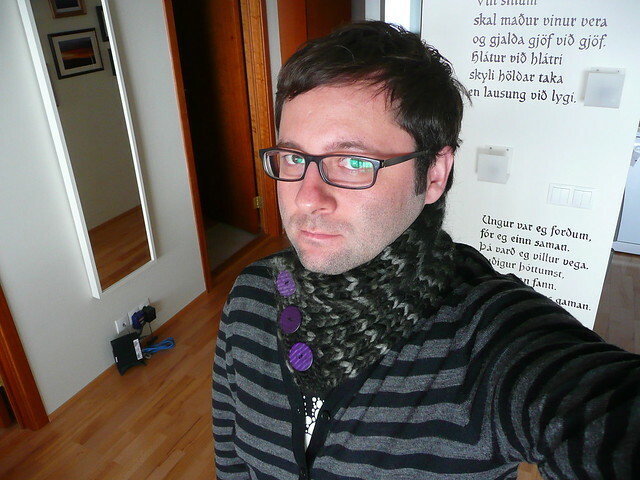 So, I wanted to try to knit a lopapeysa using only one thread of plötulopi. I am a HUGE fan plötulopi because it is much softer than létt lopi or álafoss lopi and it is so much fun to knit with it. Until now, I had always used it double., which makes a gauge that is similar to Létt lopi but I find that the stitches look much better and the colorwork results absolutely flat and beautiful. Everybody is always saying that it is so difficult to knit with a single thread of plötulopi because it breaks all the time. NOT TRUE. The thread is really strong. I must have broken it no more than three times and it was only because I was clumsy or just steped on it and pulled it. It is amazing for long the fibers of lopi are! And how strong they are because of that! 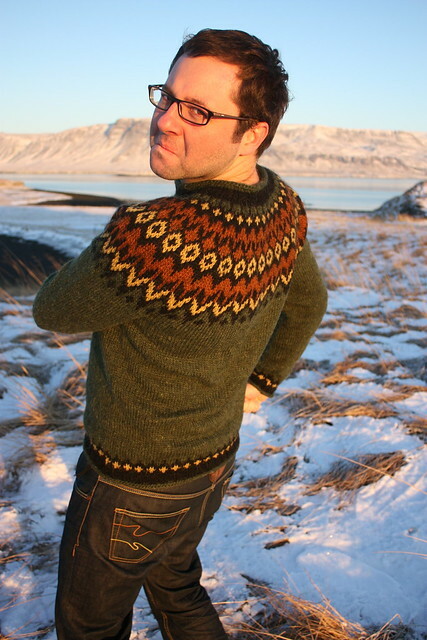 I have always liked the yoke pattern of a lopapeysa called Vetur but without all the snow pattern of the body. The pattern is written for Álafoss lopi so I had to calculate the gauge for single-strand-plötulopi. I am using 3.5mm needles for the rib and 4.5mm for the rest and I got .... stitches in 10cm. I have been wanting to have a grey lopapeysa for a long time and I found that combined with dark brown and off-white looked just great! There are so many beautiful colors in plötulopi that sometimes it is SO hard to choose! I cast on with double-stranded-plötulopi and then continued to knit with one strand. I must say that the stitches don't look as pretty as when knitting with two strands, it is a bit difficult to keep an even tension but over all it looks good. Once I had it finished I thought everything was alright but no, no. It was too small for me! Both, a bit to tight (not terribly tight though) and a bit too short in the body section but the sleeves were ok. I did definetely something wrong with the numbers. I probably miscalculated the number of stitches in needed to cast on. This time I didn't have a FURY attack and frog everything, I just left it in the basket waiting to be blocked and hopefully find someone who would want it. And I did find someone!! Vetur I: Too small and unblocked but found an owner! 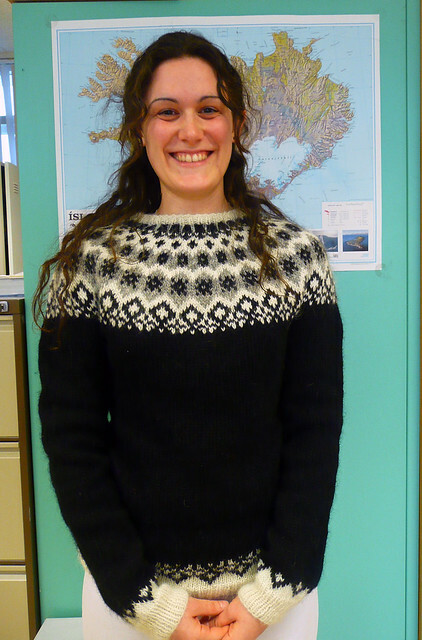 Soon after I finished this lopapeysa, a friend of mine from Italy that is now living in Iceland for half a year, asked me if I could knit a lopapeysa for her. I asked to search in the internet for patterns or an idea of how she would like it to be. She did so and to my surprise she chose Vetur!! But like me, she wanted it without the !snow". The colors she chose were black, grey and white, a color combination that I personally don't like so much (at least for me, I am much more into earth tones) but apparently it is very easy to combine. We also decided to make it with létt lopi, a much more known yarn for me since I have used it several times and I know exactly the gauge I get (as well as with double-stranded-plötulopi). The whole process went pretty quick, considering that at the same time I was knitting a shawl. In general, whenever I am knitting a lopapeysa all I want is to get to the yoke section a soon as possible. Knitting the body and the arms can be tedious and boring. No action at all! I am usually always complaining while knitting those sections (and poor Gummi is always just listening to me, hehe) until I arrive to paradise: THE YOKE!! Colorwork is so exciting. It is almost like drawing. I love to see how with every new row it is possible to see a little more of the drawing you are knitting. Once I finished this second Vetur (and the shawl shortly after) I thought it was time to give another try to MY VETUR made with single thread of plötulopi. I started a new one... this time (hopefully) the right size. I recalculated the stitches and yes, I was about 10 stitches smaller last time. So, it all began again. 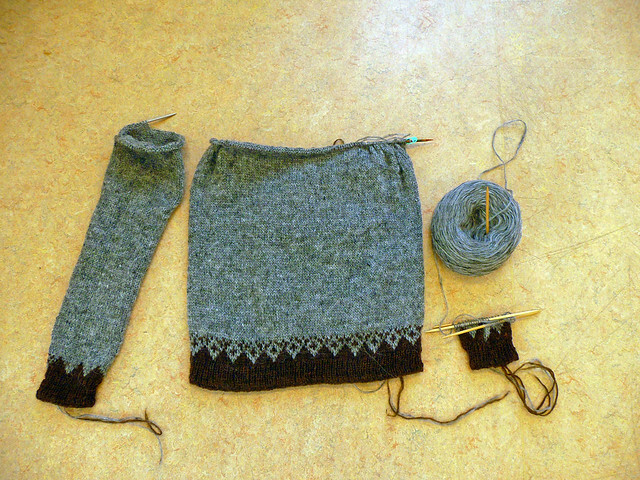 By now I have already finished the body section and one sleeve... I am getting closer to paradise! I will keep you all posted about how it goes! Vetur III: Hopefully finished over the weekend! PS: I am also starting to thing about the next shawl I want to knit. I am little bit undecided. But it will be something definetely from either of the two new books I got. For now, I already bought the yarn I will use. It is a blend of linen and wool from Evilla and I beautiful dark orange color! And to finish: Spring doesn't seem to want to come (not that I have a problem with that... if it were winter all year it would more than fine with me!) and yesterday (as most of the week) was windy, cold and started to snow one more time... today in the morning it was all white outside... wonderful! Too bad it will probably not last too long but it seems that there more snow coming over the weekend! Spring has arrived here at long last: today was the first day I didn't need a jacket outdoors, not even a sweater but simply a t-shirt and a shirt. Wonderful! What a lovely photo of you and your sweater! Ivar: Thanks for your comment :) Spring doesn't seem to want to come over here. Last week I thought I was not going to wear my parka anymore... eh eh... still wearing it! But once summer comes to Iceland... it is just wonderful (but short). Martha: Gracias! gris y café quedan increíblemente bien juntos! En realidad, creo que gris pega con todo! Anímate a tejer con colores... el principio cuesta un poco pero una vez que lo logras hacer bien es una MARAVILLA! A mi me encanta el Vetur I.
Mér finnst þú hafa verið mjög duglegur að prjóna á sjálfan þig! Maður á að vera miklu duglegri að prjóna sjálfur á sjálfan sig - það er svo gott fyrir sálina! Judi: I totally understand wht you say about going to a yarn shop. I can NEVER leave one without buying anything! Have a good time in Florida! Tricoyfotos: Gracias! Es uno de mis patrones FAVORITOS! Alex: Uuy, qué larga tu respuesta! jeje. Las piedras que tengo son más bien aplanadas, parecidas a las de la foto que te mostré. Encuentro tan difícil hacer crochet! Siempre me pierdo. Me cuesta "leer" los puntos a medida que los hago. Puff. Ya había visto el link que me enviaste, incluso hay un tutorial en Purlbee pero lo no me gusta mucho el patrón que explican. Lo que quiero hacer es algo mucho más simple que eso. Quiero hacer algo como una tela de arana. Nada más. Si me pudieras ayudar sería INCREÍBLE!! Espero no aburrirte ni dejarte chata, jeje. Saludos desde el frío (aún). Ah, y el potholder es precioso! Me encantaría hacerlo! Are you living in Iceland? Hi ,I just popped in. 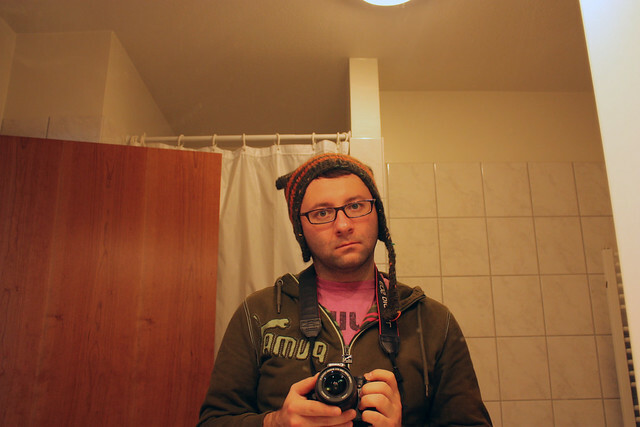 Funny pctures I liked the hatphoto :) I have the sam feeling. Just love doing hats , have many but not often use them. Love your sweater looks great and I like the colours and light in the photo. Thanks for the comment of my boots. I´m really pleased with them. Greatings from a sunny Sweden. Really interesting stuff about getting a good fit. And Boy! Are you generous with those mistakes. Rod me fui a google y puse LOPAPEYSA PUNTOS EN ESPAÑOL y adivina me dio esta blog y era el tuyo ,q increible ,tbn veo q tienes muchas visitas debes de estar feliz .la toty las hermana de ale quiere aprender asiq leestaba buscando modelos y saliste tu . 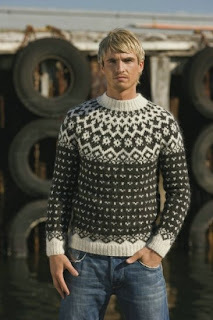 I was searching online for vests/sweaters/Samband Icelandic wool, and it led me to your blog. I would love to find the pattern for the Vetur and Ridarri, but they are not to be found in Connecticut. Any suggestions on how to take a look at the patter would be welcomed. I'm in the northeastern US, and recently completed my first lopapayesa (hope I spelled that right!) in lettlopi. I enjoyed your blog post, and will subscribe to it. I'm a woman, but think it's great to see a man knit, and I understand that all school children in Iceland learn it in primary school. I don't know why boys don't learn some housekeeping skills and girls learn some mechanical skills in the US, but it seems to have been that way forever! I have to admit, that my new lopapayesa is a cardigan, and the idea of steeking scared the heck out of me! Had to take a swig of wine before I made that first cut. Like you, I love the colorwork, but get bored to tears with knitting round and round and round in one color. And I am just starting a second project, this one in single strand plotulopi. I had no idea that I could do a pattern written for lettlopi with double strand plotulopi.